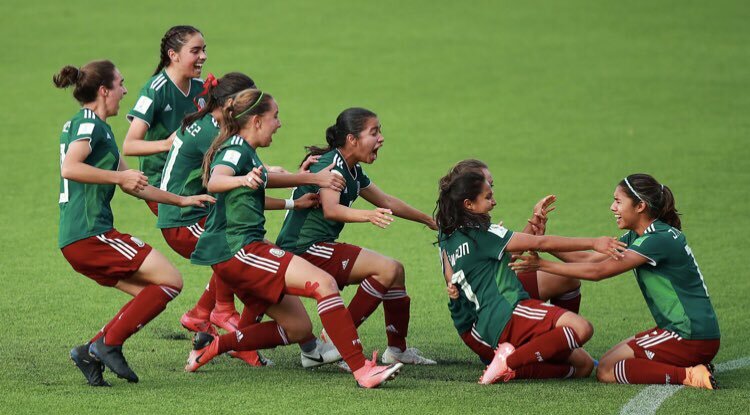 The U17 Mexico Women’s National Team won their quarterfinal match against Ghana early Sunday morning and qualified to their first semifinal round ever. It was an exciting match where Ghana scored the first goal at the start of the second half, Mexico responded next only to have Ghana score again and ended with Mexico’s Nicole Perez equalizing it a second time with one of the best late minute free kick goals I’ve ever seen. After 90 minutes the match remained 2-2 and, per FIFA rules for this tournament, would go straight to penalties. Nicole Perez opened up the scoring for Mexico but it would be goalkeeper Jaidy Gutierrez that would be the superstar of these shootouts—blocking two of Ghana’s penalties and securing Mexico’s win. A hard fought 2-2 draw and then a 4-2 victory in penalties would land Mexico in their first Women’s World Cup semifinal ever at all levels. Even if it was early Sunday morning and I was watching the match in my pajamas, I walked around pacing around the house with excitement about what had just happened. A Mexico team had advanced to the semifinals of a World Cup. A women’s team. For the first time. They had made history. This now historic team that was primarily players in the Liga MX Feminil (12 of the 21 players play in the league). 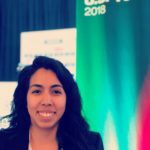 It made me think about my conversation a few months ago with former Mexico Women’s National Team player, Jenny Ruiz, where we began discussing the Liga MX Feminil and the impact it was going to have for the younger players. There was something she said that really stuck with me that she reiterated both on and off the record. It’s one of the disadvantages trailblazers often have to deal with. Sometimes they themselves do not get to experience or even live to see the benefits of the work that they’ve done. I have been pretty transparent about the lack of knowledge I had about Mexican Women’s Soccer growing up. I have discussed whether that was my own fault or a result of limited coverage from media outlets. As a growing journalist, I have made steps in changing that narrative. For the past two years, I’ve actively been keeping up with both the growing domestic league in Mexico, the veterans playing abroad, and provided coverage for the various tournaments the women’s teams have played at different levels. Alongside two other women, I work on a podcast dedicated to giving more attention to women’s soccer. One of the women on the podcast, Adriana Terrazas, has tons of knowledge and I aim to learn as much as I can from her. She’s a trailblazer. Female journalists. Female soccer players. They have existed before I paid attention to them and with the work of people like me and players like the young ladies in Uruguay who let their skills do the talking, the recognition will continue to grow. Why Not Us will linger sometimes. It is human nature to wonder what it would be like if you got to soak in the benefits of something you helped start. But failure is part of the journey. And in Mexican Women’s Soccer history, there are plenty of failures to learn from. The first attempt at a women’s league in Mexico was a failure. Since the establishment of the Liga MX Feminil in 2016, success has come around, with fans showing up at the stadiums to pay cheer on their teams—Liga MX Feminil teams that have players that are responsible for the national team making it to a World Cup Semifinal. I wrote a piece before the veteran women’s team began their CONCACAF Championship tournament (that they ultimately got eliminated from and resulted in them failing to qualify for the World Cup in France next year) about the unfair pressure that came with wanting the spotlight and how crucial winning was to validate that attention for women’s soccer. Failure from the Senior Women’s National Team is a lesson. As the U17 get ready to take on Canada in their very first semifinal match, the mistakes from the past are being learned from (hopefully). The future appears to be theirs and that’s okay. The rest of us will do our part in ensuring those that paved the way get the recognition they deserve as we continue to build momentum on what’s to come.